I can supply all colours and brands of paint, wallpaper, and lining paper, and can also supply and fit coving. The brands of paint that I normally use are Albany, Armstead, Be Dec, Crown, Dulux, Sadolin, and Zinsser. 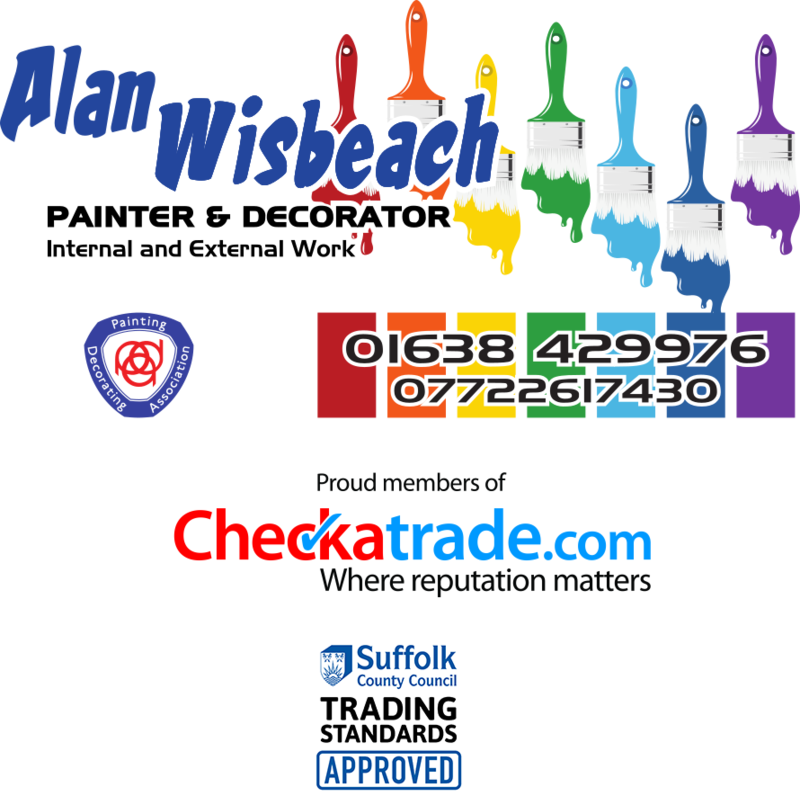 As a polite, friendly, and knowledgeable painting and decorating professional, you will be pleased to have me on your premises carrying out both internal and external work. For your peace of mind, I carry £5 million of full public liability insurance. I am also a proud member of the Painting and Decorating Association. My rates are very competitive and I always provide value-for-money without compromising on the quality of work or materials, which are always the most appropriate for the job in hand. I work quickly, but thoroughly, always bearing in mind that preparation to all works carried out is most important. I work on both domestic and commercial property, and no job is too small. If you would like a free no-obligation estimate, please don’t hesitate to contact me on 01638 429976 or 07722 617430. Website © 2019 Alan Wisbeach Painting & Decorating. This website was built by John Wallis (mobile telephone 07748 560851, e-mail address john.geoffrey.wallis@outlook.com, website address https://jgwallis.github.io), using the Hugo static site generator (© The Hugo Authors), which is available under version 2.0 of the Apache Licence, and UIkit (© YOOtheme GmbH), which is available under the MIT licence.